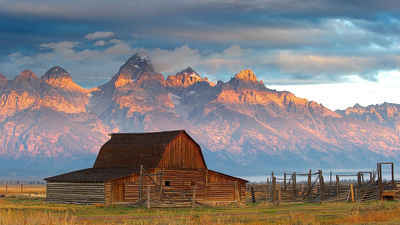 Wyoming offers the allure and fascination traditionally associated with the American west. Many of the small towns have retained their old western atmosphere and proximity to working ranches. Students can experience the wonders of both Yellowstone and the Grand Teton National Park and enjoy outdoor activities such as boating, fishing, and hiking. Wyoming gets its name from the Algonquin words for "land of vast plains." After the Union Pacific Railroad reached the town of Cheyenne, the capital, in 1867, the population began to grow steadily in the Wyoming Territory, established in 1868. Wyoming was admitted as the 44th state in 1890. The constitution of the "Equality State" was the first in the world to grant voting rights to women. Wyoming was also the first state to elect a woman governor. People are spread out across the state in small farming and ranching towns, and millions of visitors come to enjoy the Yellowstone and Grand Teton national parks each year. The state flower has the name of indian paintbrush (Castilleja linariaefolia). 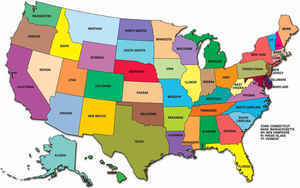 Wyoming is the smallest state in the Union in population. 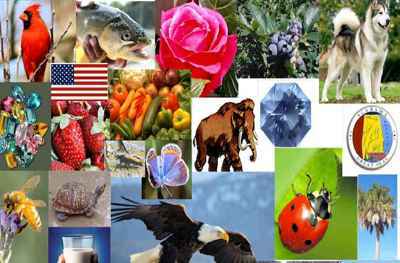 Wyoming State Symbols contains descriptions and pictures of the state symbols, emblems, and mascots of the state, which can be quickly accessed. This resource guide represents many of Wyoming state facts such as Wyoming state symbols, the state flower, the state gemstone, the state insect, the state tree, the state bird, the state animal, the state flag that flies over Wyoming, and the capital, as well as many more symbols, emblems, and mascots.